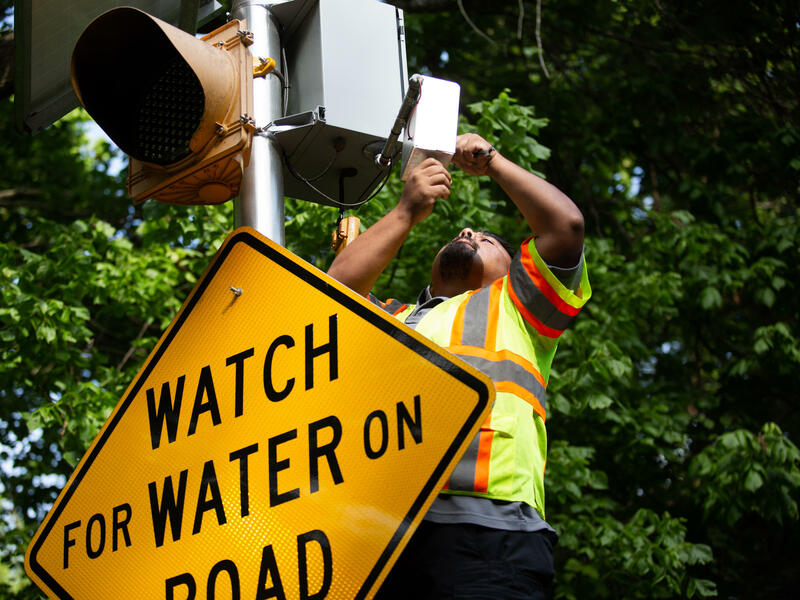 The city of Austin is installing cameras that will let residents see rising floodwaters at key intersections. Austin is in a part of Texas known as Flash Flood Alley, and the warming climate means even more intense rains. The warming climate means more intense rain in many places, and that's helping cause more frequent and more dangerous flash floods. In one example of just how quickly people can be caught up in them, you may have seen the video that went viral after a bride in New Jersey had to be rescued traveling from her wedding ceremony to the reception. As communities grapple with record breaking rainfall and flooding there have been a slew of new technologies, known as 'disaster apps,' to help alert people and keep them safe. Now, Austin, Texas, is developing its own system, one it hopes will expand to other places. The city is in a part of Texas already known as Flash Flood Alley. 75 percent of flash flood deaths in the state happen on roads, often at low water crossings where cars are swept away by flooding creeks. That fact led to Austin's latest effort to keep people off dangerous roads: a network of cameras that will let people actually see the rising waters. Austin already has flood gauges, and a website to tell people about road closures. Now it plans to have cameras send pictures of flood prone intersections, updating every few minutes. They will be connected to a mobile friendly website so people can check flood conditions on their smartphones. 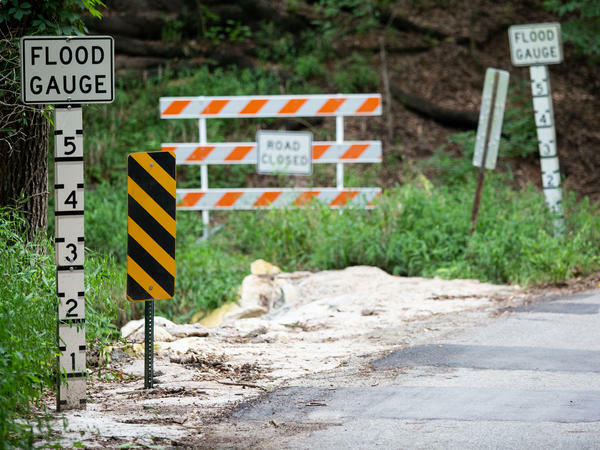 Matt Porcher, with Austin's Flood Early Warning Team, thinks people may be more easily convinced if they know ahead of time that a certain intersection is flooded. "Rather than someone having to drive up to this low water crossing and try to make a decision there, 'Well, can I make it, it's only a couple inches of water,'" he says. The hope is they will check for water beforehand and decide, "'I am going to stay off the road today.'" The city was first approached with the idea by Joel Aud, a former state Department of Public Safety employee who now works for Beholder Technology, the company the city contracted for the project. Aud says during his time at the DPS he knew that cameras on the border with Mexico were used to interdict drugs and human trafficking. When a women he knew lost her son in a flash flood in Central Texas, "it was a natural leap to say, 'All right, if we can do interdictions we should also be able to monitor flood levels.'" Along with installing cameras, Austin is working on a way to alert people about specific crossings. Other flood-prone cities, including Miami, are developing similar ways to warn people. But he warns that this type of tech often relies on cellular services or Wi-Fi to get information to the public. "A lot of times in a disaster those things will go down," he says. "So if there's no cell services and you're relying on your cell phone to power the app, and there's no wifi, then you're not going to be able to use it." In fact, spotty cellular coverage has been a challenge in at least one place in Austin. The city now has seven cameras posting photos online and hopes to put up around 20 more by the end of the year. Porcher says they've also received calls from neighboring communities who are interested. He hopes one day there will be a statewide system of cameras trained on Texas creeks and rivers, helping to keep people out of harm's way. The warming climate means more intense rain, and that means more flash floods. In Texas, officials hope that letting people see the rising waters on their smartphones can help keep them safe. From member station KUT in Austin, Mose Buchele reports. UNIDENTIFIED PERSON #1: Fire department - what's the address of the emergency? MOSE BUCHELE, BYLINE: This is tape of a 911 call during one of Austin's many recent flash floods. This is known as the Halloween flood of 2013. UNIDENTIFIED PERSON #2: I was driving and the water - the water was too fast. It's too much. I'm in the middle of the field. BUCHELE: The woman said she was driving to work and hit water. Her truck was washed into a field. UNIDENTIFIED PERSON #2: I'm holding myself on a tree. BUCHELE: It sounds like she says she's holding onto a tree. UNIDENTIFIED PERSON #1: Ma'am, do you have anything that floats? BUCHELE: The call cuts off, but this woman appears to have survived. Five others died in that flood. In Texas, 75 percent of flash flood deaths happen on roads, often at low water crossings where cars are swept away by flooding creeks. So officials here are always trying to keep people off of dangerous roads in heavy rains. In Austin, they think they may have found a new way. MATT PORCHER: All right. So we are at Joe Tanner near 290. BUCHELE: This is Matt Porcher. He's with the city's flood early warning team. PORCHER: And this is kind of one of our frequent flyers for low water crossings. Every time we have heavy rainfall in south Austin, Joe Tanner will overtop from Williamson Creek. BUCHELE: He'd come here to put in a flood camera. As we talk, the truck arrives. The team breaks out a ladder, gets to work installing it about nine feet up a utility pole. From there, it will post images online so people can see creek conditions. The city already has flood gauges to measure rising water and a website to tell people about road closures. But Porcher and his team are betting on the power of the image to keep people from putting themselves at risk. PORCHER: Rather than someone having to drive up to this low water crossing and try to make a decision there - well, can I make it? It's only a couple inches of water - they can just pull up the creek camera, say, oh, it's flooded. So I need to find another alternate route. BUCHELE: They created a mobile-friendly website and are working on a way to alert people about specific crossings. Other flood-prone cities like Miami are also developing similar ways of warning people. But will sharing images really keep more people off the streets? NICHOLAS KMAN: Yeah, I think so. BUCHELE: This is Dr. Nicholas Kman. He's a medical manager for FEMA's Urban Search & Rescue team in Ohio. He's studied the rise of what are sometimes called disaster apps. He thinks pictures can be a powerful online tool. But he says this type of tech often relies on cellular service or Wi-Fi to get the information to the public. KMAN: A lot of times in a disaster, those things will go down. So if there's no cell service and you're relying on your cellphone to power the app or there's no Wi-Fi, then you're not going to be able to use it. BUCHELE: And in fact, spotty cellular coverage has been a challenge for the team at some low water crossings here in Austin but not on Joe Tanner Lane. After the camera's up, the team crowds around a laptop on the back of a pickup truck to see how the image uploads to the website. UNIDENTIFIED PERSON #3: That looks pretty good right there. PORCHER: Yeah, yeah. I'm happy. PORCHER: That's just perfect placement, so I don't even think we really need to tweak it. BUCHELE: There are now seven cameras posting photos online in Austin, and the city hopes to put up around 20 more by the end of the year. Porcher says they've also gotten calls from neighboring communities about installing them. He hopes one day there will be a statewide system of cameras trained on Texas creeks and rivers helping to keep people out of harm's way. For NPR News, I'm Mose Buchele in Austin. (SOUNDBITE OF SONG, "BURNT BACK") Transcript provided by NPR, Copyright NPR.